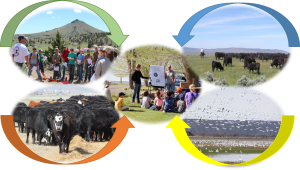 This website is maintained by OSU – animal, range, and forage sciences Extension personnel with the purpose of providing up-to-date information to the beef industry in Oregon and throughout the country. In this website you can find details and contact information for all the OSU livestock/range/forage Extension agents and specialists, location and details about OSU research facilities, current and upcoming extension events, and extension and research publications such as the Beef Cattle Library, Beef Research Report, Calving School Handbook, and the revised Cattle Producer’s Handbook. If you’re unable to find the information or publication you need on the website you can even submit questions related to beef cattle production to OSU Extension professionals across the state. We hope that this website enhances the delivery of scholar and extension information to the beef industry, and facilitates the communication among producers, industry personnel, and OSU – Extension faculty.